Planes, trains, buses, trucks, and, oh yeah, boats. No matter what mode of transportation, the tour of China often felt like a roller coaster ride. Some nights, driving between venues, we would sleep in the cramped seats of our tour bus and arrive at a beautiful "state-of-the-art" theater. On other occasions we would check into a classy hotel, only to discover the venue we were performing at was a run down gymnasium that reeked of urine. 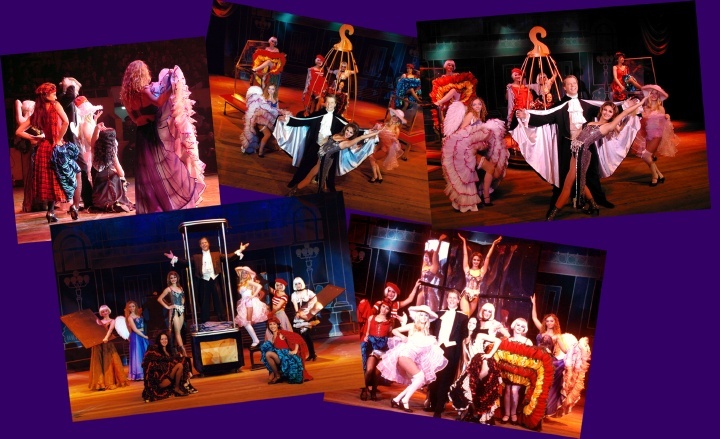 Many of our audiences had never seen a western style theatrical production. They were all excited and appreciative of our show. Many of the venues as well had never hosted as large a production as we brought. But, like the saying goes, " The show must go on!" And that it did, without fail. When riding a roller coaster, it's best to just hold on, enjoy the ride and try not to puke. In many ways China seemed to be a land of contrasts. A land that is rich in history and tradition, yet still quite modern in certain respects, particularly some of the unique architecture in the major cities. A culture that is wise enough to embrace the bicycle as a viable mode of transportation versus a recreational activity...not to mention, good for the environment and downright healthy. Pedal driven Rikshaw operators had cell phones and the hotels had light switches that flip up, to turn off. I was impressed and confused at the same time. When we arrived in Wuhan, a large city in the center of China, the contrasts continued. We had two shows in two nights at two different theaters. The first theater was brand new and very clean. Some cultural differences were inescapable, for example, the backstage bathrooms had porcelain holes in the floor for toilets, or, as I've heard them called "squatty potties." That is a cultural line that I, personally, had a hard time crossing. 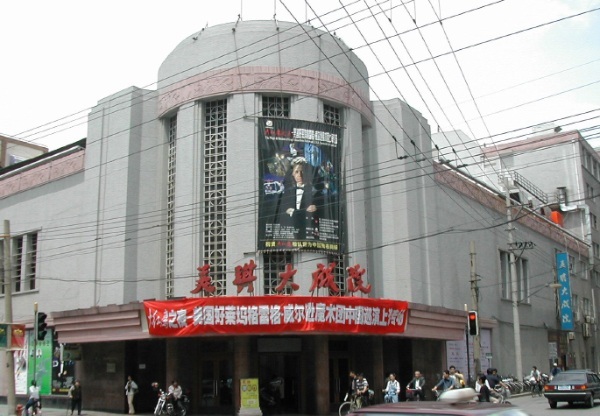 The next day, we loaded into an older theater that was used for many years as a communist meeting hall, as was evidenced by the 4 story tall statue of Mao in front of the venue. The local crew had a habit that is prevalent in much of the country... Spitting... at any time... on stage... in the audience... everywhere... it really didn't matter to them. We jokingly deemed this the "Stepping in History Tour." Smoking, incessantly, with no knowledge of the health concerns is another culturally conflicting habit. It was amazing to watch these three different cultures meld together and adapt to each others needs as best as they could. "We just want to do some magic for the people." While the venues varied greatly, the traveling conditions were not exactly reliable either. Buses and Taxis often broke down in the middle of intersections. One of our planes landed at the wrong airport to refuel. Another local promoter didn't show up at the train station to pickup the cast... and so on... But, despite all the obstacles, Greg, the cast and the crew held true to the vision , as Greg's father Mark Wilson so aptly says..."We just want to do some magic for the people." The obstacles unrelentingly continued. At one show, during intermission, the sound board began smoking. A nasty habit. 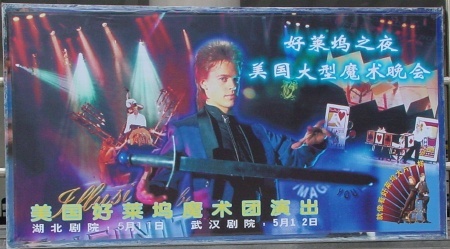 While the Chinese sound crew did their best to resolve the situation, Greg took the stage with an interpreter and did just that, "a little magic for the people." I grabbed my portable mini-disc player and ran for the sound booth, which happened to be at the very back of the theater, up several flights of stairs. 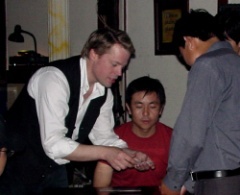 Not only was it stressful backstage, but the audience did not understand why Greg was doing small magic tricks. Without the sound system it was very hard to communicate to nearly 2000 people. Things started to get rough. Just then, like magic, Greg's mic and the translator's mic both started working! They explained the situation and the audience was back on our side. Phew! Once we had music, act two began. As I watched from the sound booth, however, I realized something important. I'm supposed to be backstage to do my job...RIGHT NOW. I flew down all the flights of stairs to hit my mark. Life seemed to move in slow motion. Fortunately, nobody was killed or maimed, and another successful show was completed. Throughout China, security was a big issue, not for people or things, but for the Magic Secrets! Theirs is a very curious and investigative culture. Many people tried to watch the show from the side of the stage. This is not a good idea for magic, especially a show with many large illusions rapidly going on and off stage. It can be physically dangerous and potentially economically dangerous by exposing the secrets! Reporters are always looking for a new "angle!" name of the town we happened to be in. But, I can assure you, it's easy to forget the name of the town you're in when you've been on the road for this long. Especially when you have a hard time pronouncing the name of the road you're on. At one "so called" arena outside of Qing Dao, the beer capital of China, we watched in amazement as the local crew began kicking holes in the suspended ceiling from 150 feet overhead. It was the first time in this 65 year old building that they needed to hang curtains and lights. Random body parts busted through the ceiling while broken tiles fell like autumn leaves, followed by hanks of heavy hemp rope that cascaded to the arena floor. It was a sight to behold. In the middle of a show in Beijing, the capital city, I turned around backstage to discover an unknown photographer taking unauthorized pictures. 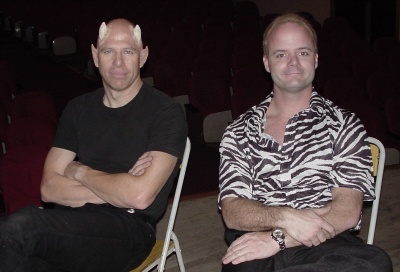 I jumped up from my position and blocked the exit while our 6'6" tall demon character, John Grantham, complete with horns, pointy ears, and fangs, loomed over the reporter and easily removed the film from the camera. I think that Greg still has the exposed roll as a trophy. Almost every theater had video crews show up to tape the show. It became a daily chore to find out who they were and where the footage might be used. After one show, Greg finished the finale bow, then ran outside the theater to stand in front of a camera crew's van to prevent an unauthorized video from leaving the premises. It wasn't Tian-an-men Square, but it was impressive. 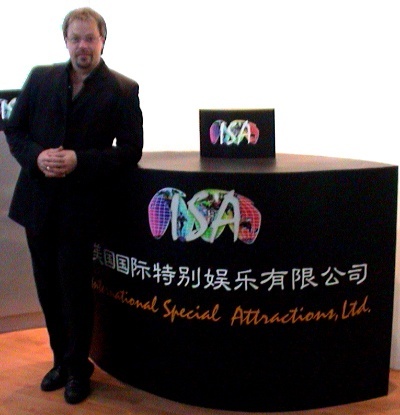 In the midst of all the hard work and grueling travel, the Chinese/American producers of the tour, ISA, did their best to make the tour as comfortable as possible. Their team, headed by Mr. Ge, Hai Ping and his vice president Mr. Xu (pronounced "Shoe") provided us with 3 phenomenal interpreters that were indispensable, not to mention, amazing people. Ken, a young college graduate with a degree in accounting, found himself in charge of lighting and curtains. 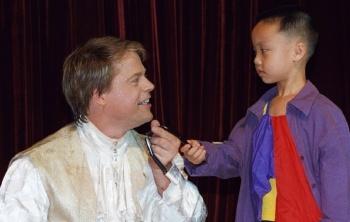 Johnny, another highly educated literary translator, acted as our advance technical coordinator and on-stage translator. And finally Sandra, a lovely young graduate, who not only organized the transportation and housing, but also maintained costumes, actually had a secret job performing in the show! I think we changed their lives as much as they influenced ours. On days off we did everything from shopping in the streets of Shanghai to visiting the Great Wall. Our trip to the Forbidden City in Beijing was quite memorable. The most interesting trip for me was the four-day cruise on a ship down the Yangtze river to the Three Gorges. This wasn't exactly a luxury liner, but the journey was definitely worth it. We visited towns and historic sites that will be more than 500 feet underwater once the world's largest dam is completed this October. The landscape was breathtaking and the overall experience was, at times, surreal. Our boat broke down in the middle of the Yangtze during a smaller excursion to the Three Minor Gorges. Fortunately, Greg had a deck of cards with him and began performing sleight of hand for our fellow stranded sightseers. I was proud to watch an artist who performs for the love of performing, especially since the little tour-boat was only loosely moored to an outcropping of rocks in one of the more turbulent portions of the river. Shortly after the engine was fixed, the whole boat was restrained by some Chinese bureaucrats attempting to extort money from us. After some clever arguing by Mr. Xu our group was sent on its way with no money exchanged. Everyone present had an interesting lesson that day, "Entertainment = Good." "Extortion = Bad." We never really did know where the tour was going. Yeah, we were in China, but what cities, what theaters, what hotels... none of that could be confirmed as things are constantly changing in the People's Republic of China! We just had to wait and see. All we did know was that Greg Wilson was making history with the longest tour to the most cities ever done by a Western artist (of any of the performing arts) in China. Throughout the tour I was continually shocked and surprised. Each time the four huge truckloads of equipment were unloaded, set-up and utilized to create two hours of entertainment, I was amazed. Mission impossible became mission accomplished. The amount of work that each individual had to do to accomplish this feat was daunting. The obstacles were plenty, from the language barriers to the varying performing conditions. We came to do a little magic for the people and that we did. I sincerely thank Greg Wilson for the unbelievable experience and every single person involved for the lessons learned. I may forget the names of some of the cities we visited, but I will never forget...China! 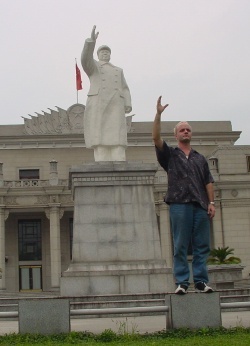 In early 2002, I received a call from Greg Wilson, asking, "Do you want to go to China?" "Sure," I replied, without hesitation. However, as Greg told me the details about the China tour, I realized this meant a great deal of work. 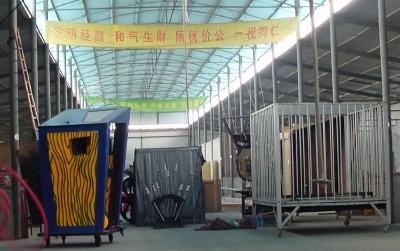 Heading to China would be two 40-foot containers with over 30 illusions, many large set pieces, and between 15 to 20 backdrops and curtains, making it one of the largest touring magic Illusion shows in the world. In addition to the physical stuff of the show, Greg also put together an impressive on-stage cast of 12 artists from the USA and Russia, and a large creative/technical crew from all over the States. Greg's brother Mike Wilson (the little kid on the Allakazam shows) and his company I.S.A. 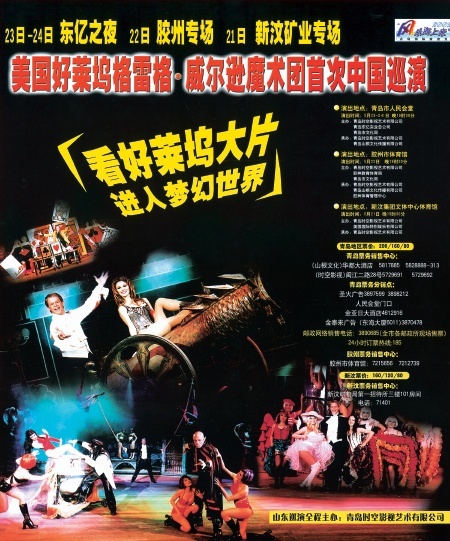 Ltd. (International Special Attractions, the executive producers of the tour) not only organized the tour and the management team in China, including three interpreters dedicated to the show, but also the large crews of local Chinese labor at each venue. I anticipated an adventure, since I have toured with Greg many times in the United States. But performing overseas presented a whole new world of challenges. I have many amazing memories from the U.S. tours alone, enough to last a lifetime... like driving a truck and 25 foot trailer across a solid ice highway in Nebraska in February... changing trailer tires in the middle of a Missouri summer while ticks are jumping up our pantlegs.... or, high winds pushing the trailer out from behind us and causing the truck and trailer to travel down Interstate 10 sideways. Wheeeee! Show business requires a dedication that the audience never sees. 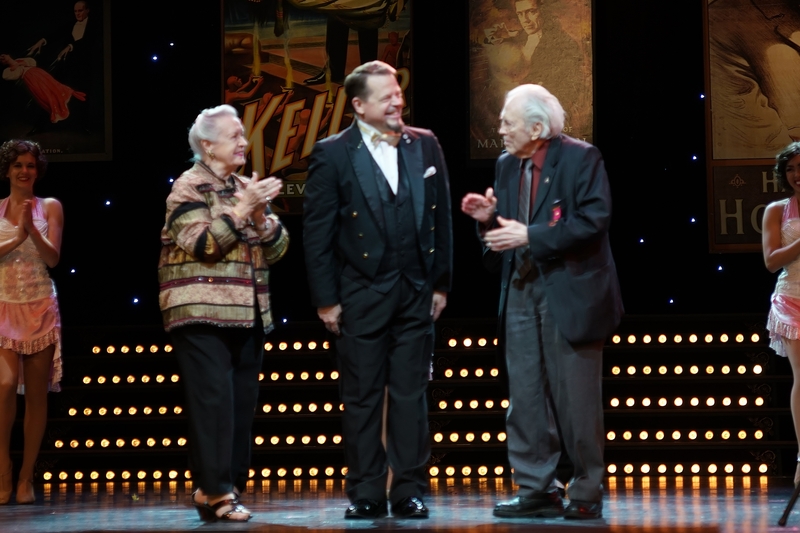 The traveling magic illusion show is a blending of touring theater and circus. Everyone in the production contributes more than just their performance. Greg will handle all the pre-production demands, then the rest of the team will assist with the other chores. For example, time allowing, I often help Greg actually drive the show props to the theater, be it around the corner or across the country. Fortunately, we had four big trucks and a giant tour bus with local drivers for the China tour. 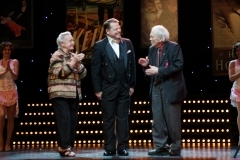 on April 20th, I arrived with Michael McGiveney, the show's technical director, and Katherine Hope, the choreographer. Greg Wilson (the head honcho) and Hugo Wei, Greg's assistant producer, had been in Shanghai for one week, frantically preparing and purchasing supplies. The seven Russian dancers would arrive in a few days and John Grantham, who portrays the evil demon, could not come until mere days before opening night. For the rehearsal period, the cast and crew were at a decent hotel in Pudong, just outside of Shanghai. During those two weeks we didn't see much of China except the road from the hotel to the rehearsal hall. And the rehearsal hall itself was a unique place to work. It consisted of a former warehouse used to store and sell produce. The ISA team did their best to install a wood floor, mirrors, and lights for the dancers. With the exception of one day, the weather was gray and dismal. And, unfortunately, there was not much to be done about the mosquitoes who brought all their friends to dine on us, the foreign buffet. We ate, slept and rehearsed. Local Chinese workers were hired to work on the props, that is, the props that were there. The second forty-foot container of illusions was delayed getting through customs. Theoretically, it would arrive the day before we loaded into our first theater. Time was running out. Props weren't ready, costumes needed re-fitting, and whole sections of the show still needed blocking. And what... give up show business? Eat, Our final dress rehearsal was like a train wreck. Their computer controlled fly system had scenery and curtains flying in and out at random... There were logistical problems getting 30+ illusions on and off stage... Cues were missed and sometimes things just came to a grinding halt. Stress was high, we opened in a few hours. Greg and producers were, at the very least, concerned. You see, for every cue to happen, every light to be focused and virtually every prop to be moved, the cues needed to be translated into the three different languages of our team. Not only does this process take time, sometimes there is no time. And Greg was the only one who understood English, Russian, and Chinese. He did his best to solve the problems and ease the promoters fears. 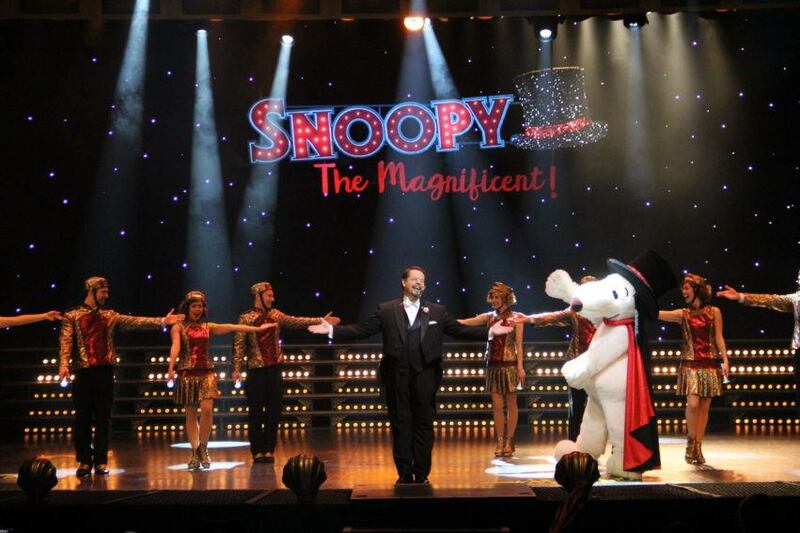 Michael McGiveney said many times, "The real magic is the show itself, not the individual tricks. So stay focused and together we can all do some magic!" At this point, the show is out of any one persons control. Every single worker, from the spotlight operator to the person pushing the props around, has to focus and get the job done. On this particular night, the magic happened! When the show ended, the crowd applauded and cheered... the curtain closed... and the reporters asked for interviews... The show was a big success! I was more than relieved, I was surprised, and downright shocked. But the tour had only begun, surprise and shock would prove to be the norm for the next two months.